Ah, beware of roadside attractions, because as we all know, they’re just fronts for bloodthirsty cults in search of sacrificial offerings. 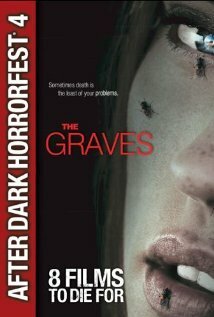 The Graves is a dirt-cheap, low-budget fright feature that nonetheless delivers a bit of gore and sinister atmosphere. It also boasts a pair of hot and snarky rocker chicks getting chased all over the Arizona landscape by some horror film veterans, including Bill Moseley (Texas Chainsaw Massacre II, The Devil’s Rejects) and Tony Todd (Candyman, Hatchet II). Megan Graves (Clare Grant) and her little sister Abby (Jillian Murray) are comely aficionados of comic books, heavy metal, and schlock culture. In search of a good time they happen upon Skull City, a ghost town tourist trap that turns out to be a death trap. Under the direction of Reverend Stockton (Todd), sightseers are routinely captured and sacrificed to a disappointingly unseen demon that provides for the townsfolk of nearby Unity, Arizona. Megan and Abby are pursued, grabbed, escape, and then pursued some more by a bunch of desert-dwelling wackos, many of whom are killed by the surprisingly resourceful sisters. The Graves isn’t a great movie; it isn’t even a pretty good movie. But once again we have a writer/director, in this case Brian Pulido, who shows promise. And if he had more than a few hundred bucks in his bank account he could probably make a heckuva film. Kickstarter?